Baratza Encore Review:Why This Baratza Conical Burr Best? Requires small space on your kitchen counter top. Get clogged with very oily dark beans. You can use medium dark bean for this grinder or grind less than 20 gram at a time. If you want to have a quality, all purpose burr grinder, Baratza encore conical burr grinder is your best option. I will suggest you this super grinder only when It can meet your all need. While buying grinder first of all focus on your habit. Which coffee brewing you are accustomed of. Does Baratza encore offer you the exact grind for your chosen coffee preparation? Then comes with the quality of your grinder. And next you think of your spending money. Now If all the things goes with Baratza encore, then it is your perfect grinder. And we checked many customers' opinion who mostly recommend it for manual brew like drip, aeropress, siphon etc. Have you ever wished for a grinder for both manual brewing and espresso? Well, now you have it. Start with your morning with Baratza encore conical burr grinder. It is a great versatile grinder for your favourite chemex, drip or pour over, cold brew, French press, siphon or Areopress, that is, all of the popular manual brewing methods. And yes, it has grind setting for espresso too( though a good espresso grinder should be your right choice if you love to brew excellent daily espresso)! Whether you are new in the coffee world or exhausted with your blade grinder and want to plan to try another , It is your best option. So let’s go through our Baratza Encore review to explore why coffee connoisseurs are recommending this coffee grinder highly. Why Baratza Encore is best? Baratza encore brings all the things you need for your consistent and fine precise grind. A bundle package (combining baratza burr grinder, digital pocket scale and dusting brush), 40 easy grind settings, large removable bean hopper, single cup or any amount grind, quick front-mounted pulse button, easy on-off switch, large ground bean pot, quite operation, solid design, automatically resetting circuitry and a powerful DC motor give the grinder a unique identity. And more, it is easy to use and clean as well as looks nice with little space on your kitchen counter. You will like Baratza encore most for that bundle. This nice addition makes your work easy and let you feel comfort with the spending money. That smart digital slim pocket scale, you can weigh roasted bean or ground coffee pot. Another I love is that fine dusting brush with robust handle and yellow bristles. Just to enjoy your grind! Baratza encore got more settings and consistent grind which is A-1 matter to every serious coffee lovers. Its 40 precise grind settings is so easy to adjust and they give you different grind size for each of your brewing methods. After-all, Baratza is capable to meet all your demands as an entry level grinder. I also like that large hopper enough for 8 oz of bean. You can easily remove it w hen you need. Just rotate the hopper counter clockwise and it’s done. It’s of great pleasure that you will ‘be able to grind any amount of coffee with this grinder. If you desire to have a single cup only for you, or a full pot, it is that grinder. Actually it may not be a problem even with one scoop of beans! Baratza encore includes an exclusive function- a front mounted pulse button, in case; you want a quick grind into your brewing basket. Pressing this front mounted pulse button you can grind on your demand and directly pass your ground beans into your brewing machine without a mess. Another feather for i like Baratza encore burr it’s got easy on-off switch. Whenever I think that my coffee beans are ground enough, I can off the switch with one touch. Like other burr grinders Baratza also has nice ground pot with the ground bin capacity of 5 oz or 142 g. Easily removable and you can weigh precise amount of ground coffee bin placing the pot on that smart costline digital kitchen scale. As a burr grinder, Baratza encore conical burr run comparatively quiet while grinding. 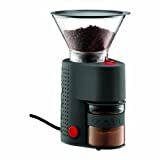 A little loud sound produces when it is operated, but so smoothly it grinds, seems to be very expensive grinder. And that little sound can’t be so important matter if you ask me as it works excellent with consistent, fine, smoothly grind that offers you best flavor ever. But, like any other grinders, Baratza encore has it‘s bugs. It does mess with the oily dark beans. You can use medium dark bean. And if you cannot help but using these oily beans, use it less amount that is, less than 20 grams may not be a problem. Though you will find grind settings for espresso and coffee press, the consistency on those settings is not as excellent as that of manual brew. Other functions i.e a porta-filter, a timer or an auto dosing system that can not be found in this Baratza encore. Amazon is your great place to have your any product securely. Overall the customer reviews on Amazon are positive. One user claims to have this Baratza encore over a year suggesting not looking for others. Another says he’s ordered his second Baratza as so much he likes it. But there are few points raised they do not like. One repines that grinding sound is somewhat loud. Another customer complains about the static electricity can cause a mess. But what I think it is a machine, alright? In all the things you will not find defect less. It is not a wise thinking to leave this grinder merely remembering these some simple cons. I will recommend this Baratza encore avoiding all these slight disadvantages as it fulfils all the essential functions of a grinder. 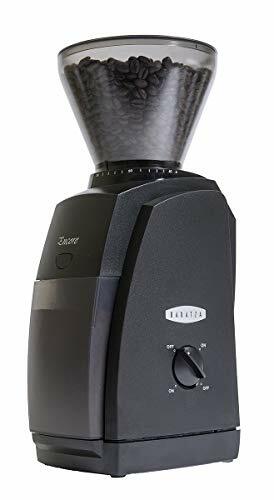 this superb Baratza encore conical grinder is a great home grinder to make you feel great in home with your best cup of coffee. Why I prefer Amazon for it fulfilled any order promptly and their delivery is also quick. And if you have any problems with your product just inform them and they take their responsibility. So many positive comments from the buyers make me feel here safe in any kind of purchase.